Bits and cutters of industrial and dental quality: Cutting Discs. 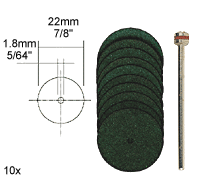 The cutting discs are available in 22 x 0.8 and 38 x 1mm (7/8" or 1 1/2" x 1/32"). Nearly unbreakable, making it usable to remove stock. 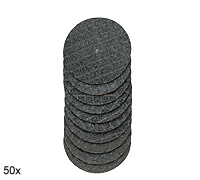 Will cut alloyed, standard and stainless steels, non-ferrous metals, and even wood and plastics. Mandrel Ø 2.35mm (3/32"). 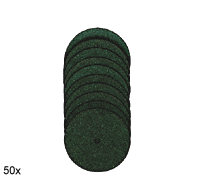 Synthetic resin bonded aluminum-oxide cut-off wheels for cutting metal, non-ferrous metal, alloys, stainless steel, wood, plastics and some softer stones. 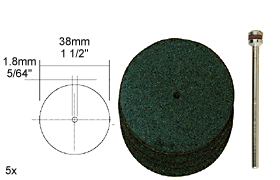 Note: The cut-off wheel is designed for cutting on its outside edge only! Do not use the face of the wheel for grinding! All mandrel shanks Ø 2.35 mm (3/32"). 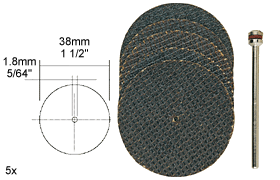 Wheels in 22 or 38 x 0.7 mm (7/8" x 1/32" or 1 1/2" x 1/32"). 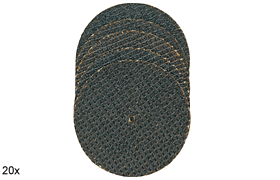 Spring steel metal cut-off blades for cutting non-ferrous metals, plastic and wood. Ideal for model-building. 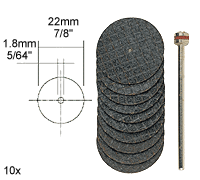 Wheel: each one Ø 16, 19, 22mm (5/8", 3/4" and 7/8"), 0.1mm thick, shank of mandrel: Ø 2.35mm (3/32"). 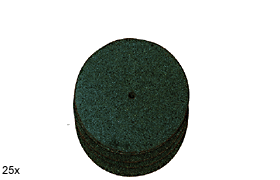 For cutting, grinding and deburring. Same application as described on the left. Less heating up due to cooling holes. No burn marks! Shaft Ø 2.35mm (3/32").